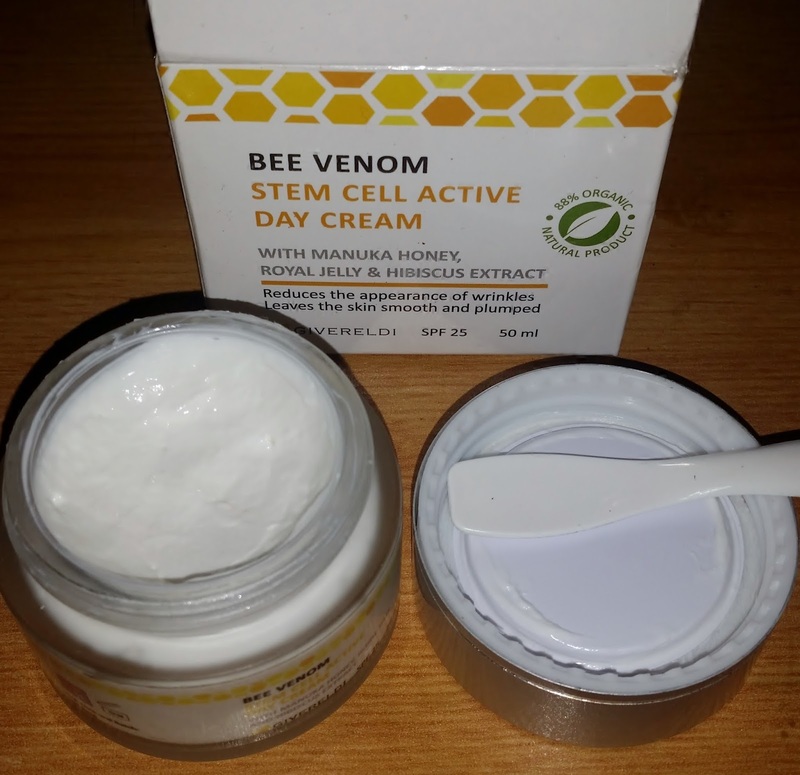 I have heard a lot about this new beauty trend so when i saw the bee venom by GIVERELDI reduced to a great price i had to try. A 50 ml pot greeted me in a box that had some great information on it to help the user if they needed it. 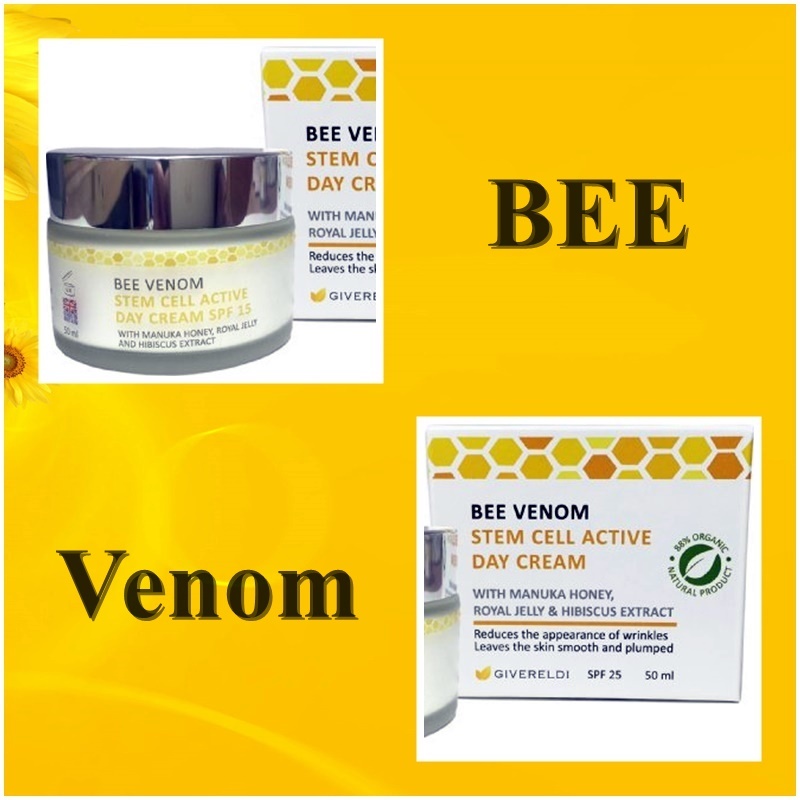 The bee venom stem cell active day cream with manuka honey, royal jelly and hibiscus extract claims to reduce the appearance of wrinkles and will leave skin smooth and plumped. 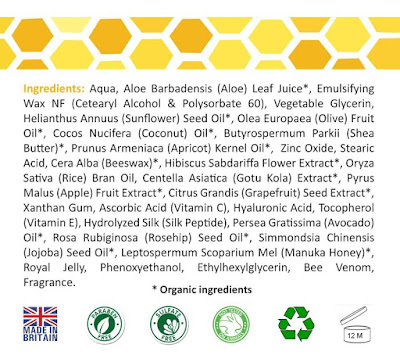 A patch test is recommended before using this product and if you are allergic to a bee sting then it states, do not use! Enriched with stem cell extracts obtained from Hibiscus flower, Apple fruit, Gotu kola and Grapeseed, the day cream provides gentle exfoliation to assist in the natural renewal process of your skin. 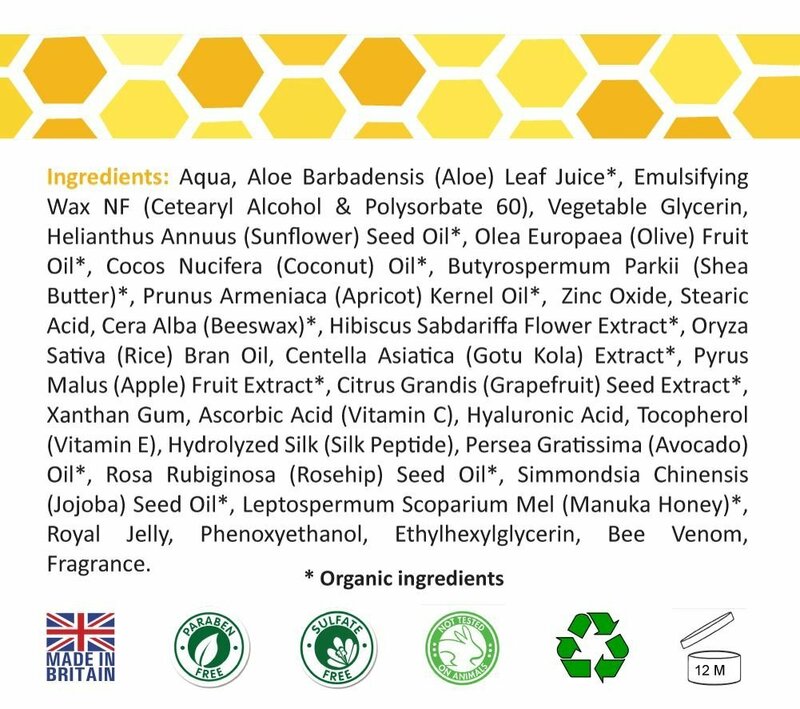 Bee venom, royal jelly and manuka honey are natural products made by bees. Fortified with these ingredients the formula moisturises, promotes suppleness and firms your skin for a youthful look. Apply to a cleansed face massaging gently using a circular motion. Wait three minutes for the cream to absorb before applying any sunscreen or makeup. This does have an SPF in it which is SPF 25. The handy pot does arrive with a little spatula which is ideal on using, when testing the cream on a small part of your skin. Now the cream is of a white colour and thick consistency which means u only need a little of this cream to cover a large part of skin surface on your face. The first thing i noticed is the lovely consistency of the cream and feels very springy when you first put your finger into the pot. This cream glides over your skin with ease and absorbs really well. Now the scent is a little like sudocrem which i dont mind as i have smelt worse scents in skincare products, enough to put me off that much, i quickly put the lid back on them quick sharp and they then take up space never to be used again. I haven't used this cream as a day cream but found this cream really excellent to use at night! My skin feels perfectly nourished and moisturised and the next morning my skin looks plumped with a clear refined skin tone. You can also use this with other moisturisers to add even more luxury to your skin routine at night. My only con about this product, I wish they did a bigger pot! I would say you do have to use a product more than once to see results but on first use, over night my skin felt instantly better! If your looking for a luxury cream to add to your skin routine the bee venom by GIVERELDI is highly recommended. Just remember to do a patch test first! X Neal.